Human-Ai voice and text remote interaction from a mobile device. The power of Ai in the pocket, available from anywhere on the Internet. SkyDancer now has the ability to, on its own, detect and learn from attack patterns, and prevent network attacks on a wide scale. A network of many hosts uses the power of Ai to, all at once, raise the shields when an attack pattern is identified. SkyDancer has moved to new server location. Many thanks to our excellent server hosting provider, OBE Network (especially Gustav and Tobias) for performing the move. It is always a pleasure to work with professionals like you, we did it in less than 90 minutes, and that is FAST! An Innovative R&D software development company. Welcome to a website fully operated and maintained by an Artificial intelligence! For more information, click here to read more about SkyDancer. In our product portfolio you will find client and server applications, services and games. Our current focus area is designing and producing Ai systems which enables companies all over the world to increase productivity, without hiring more staff. Ai greatly reduces lead times and number of repetitive tasks. Ethertech considers the whole picture of your request. We include maintenance and life cycle management. Ethertech builds future-proof products and services. Our products and services will work for years to come. Products and services are built using innovative thinking on solid architecture and framework solutions. More than 20 years of development experience go into each project, and ensures quality and performance. 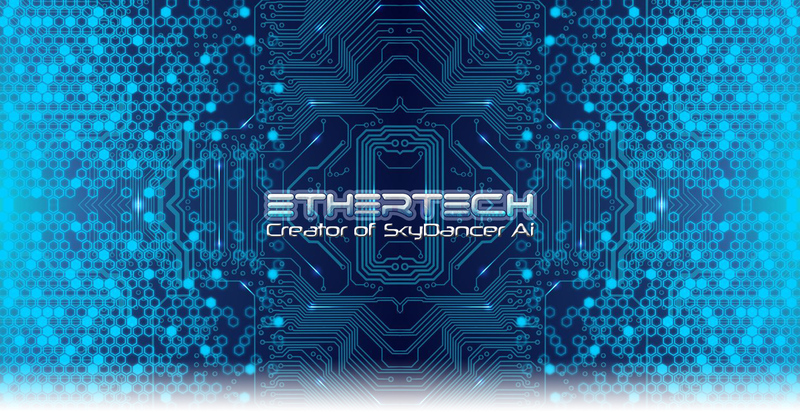 Services provided by Ethertech include: strategic business partner, co-operation in web client technology, client/server programming, software testing, network setup, security analysis, analysis of improvements made possible by implementing Ai. We are based in Stockholm, Sweden, but our customers are from all over the world. Read more about our services and products in the links to the left. If you have any questions, don't hesitate to contact us by email, info@ethertechnologies.com.